If you’ve ever worked on a project that you absolutely love, you know the feeling of being completely in alignment with your work. This is what blogging is for me. The best part is that this project (aka blogging) has turned me from a spender to a creator. And I stumbled into it by accident. I don’t obsess over being frugal or spending less, I focus on being creative. The side effect is that I spend less and money isn’t as stressful. Let me back up a bit and explain my journey from full-on-spender to budget-savvy-creative. Update: I published How I Made $45K Blogging In 1 Year While Working Full Time to share my journey. Check it out if you’re interested in blogging. You can get started with a free PDF here. Before I started my blog, I didn’t think about saving, investing, or being smart with my money. I wasn’t thinking about my student loan debt. Before I started my blog, I was thinking about spending my money and not having enough to buy what I wanted to buy. If I wasn’t in class, studying, or working, I was thinking about spending – whether it was shopping, eating out, or going on a trips with girlfriends – I was always spending. I needed more money to maintain a life I couldn’t afford. And I had more student loan debt than I had any idea about. I knew nothing about my debt until I graduated. I’m a spender, no doubt about it. This is why I don’t have a credit card and never have. I looove to spend money. And I’m okay with giving up points. I know myself well enough to know that the temptation would be too much for me. So, I prefer not to use one. Fast-forward to late 2011 when I passed the Ohio Bar Exam and started working as a lawyer. Up to this point, I had thought about money as a means to consume – to afford my lifestyle. Then, after starting work as an attorney, I looked at what my student loan debt was. Come to find out I was in $206k of student loan debt. I did the math and realized that my $75k salary was not going to cut it. I was technically financially bankrupt and would be for a while with my student loan debt so high. I was so confused how this happened. I was also super pissed. I expected to start making tons of money that would allow me to buy everything I ever wanted. Growing up, everyone said work hard, go to school, go to college, then more college so you can get a good job and have a good life. I did all that, and I ended up broke and in a career I was learning I hated. So, I decided to start listening to Suze Orman and Dave Ramsey on my commute on my podcast app. Then I read a personal finance book, then two books, then three (read the top 5 personal finance books everyone should read here). I realized through these resources I had missed the whole “learn about personal finance” thing growing up. I knew nothing. So, I decided to start a blog to talk about money. I didn’t read blogs. I really couldn’t name one at the time. I have no idea what prompted me to start it other than being mad. My goal with starting a blog was to teach people about money so they didn’t end up like me – a struggling lawyer who hated her job and was broke. Little did I know blogging would change me forever in ways I couldn’t have imagined. Once I started blogging, I had a new outlet for creativity. I was writing, learning about blogging as a business, and helping people with their money. Blogging was my new hobby turned side business. Instead of thinking about shopping, what I was going to wear out, who I was going to dinner with, or where I was traveling to next, I was thinking about my blog. I was thinking about creating new content, improving my design, building my platform, and how to make money blogging. Then, I noticed the strangest thing had happened – I wasn’t spending so much money anymore I was focusing my energy on something new, something that sparked my creativity. And therefore, I had less energy to spend on consuming. My mind was now focused on creating a successful blog. And just like that, spending less got easier because I was focused on creating instead of consuming. Starting a blog changed my life far beyond anything I imagined. I learned how to use my creativity to be aligned with my work. It’s easier for me to spend less money because I’m not thinking about consuming. My focus is on creating, not consuming. There is nothing better than having the time fly while you’re working. This happens when you’re totally in alignment with your work. I have this with my blog. My blog led me to fall in love with personal finance, which led to quitting my job as an attorney to become a financial planner. I have a deeper sense of maturity because I understand the difference between consuming and creating. I don’t feel like such a victim to consumerism. I feel like I have more of a choice. Before my blog, I thought consuming was what I needed. Now, I know it’s not. I’m an online influencer. Something I never dreamed of before blogging. I’ve learned about marketing, sales, web design, Photoshop, and social media, just to name a few of the technical things. I understand what it means to have ownership in something I created and no one can take that away from me. It’s awesome and unlike anything else. Blogging taught me it’s important to invest in myself. 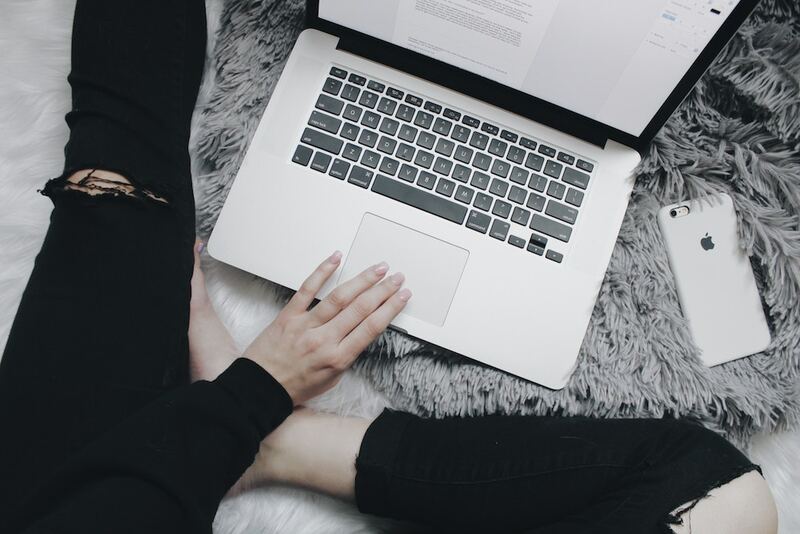 I wouldn’t be making any money blogging if it weren’t for taking a risk and spending money on courses, like Six Figure Blogger, which taught me how to monetize my blog. I understand the value and power of perspective. I choose to look at my debt as a blessing. Without it, I would’ve never learned about personal finance, business, or blogging. And I am forever grateful for that. I never could have imagined how starting a blog would change my life. In a practical sense, my blog helped me change careers and cash flow paying down my student loan debt. In a deeper sense, it sparked creative energy I didn’t know existed. It allowed me to be in complete alignment with my work. To learn how to start a blog, take Launch Your Blog or join my free course below. For all of my blogging posts, visit my Online Business Training.